Excellent Land and building opportunity in a part of Southern California that offers a quiet life among tall pines, a small town community atmosphere and lot's of tourists. Only an hour from Palm Springs and Redlands, located in Riverside County, you can own and operate the restaurant concept of your choice and work the hours you want. A new Community Center is being built NEXT DOOR to this restaurant. Voted one of the most artistic communities in the nation by Sunset Magazine, you can be a proud owner of a quality restaurant building with a lot of extra's. Pride of ownership evident with recent remodel and1,000 gallon grease interceptor. This is a unique Alpine Setting with clients driving from as far as Ventura County. Have you ever considered slowing down a little and living the good life? If so, this may be a great opportunity to own a piece of paradise. Located near the center of town, this property is heavily discounted from the pre recession days and is an adorable, quaint restaurant the locals love. .62 Acres with ample parking, the property/restaurant has both front and rear patios, plus extra storage in an outbuilding in the back. Plans are being drawn for a new community center to be built next door which will only increase traffic and patrons for the restaurant. Sewer connected. Back Flow installed. Historical building and you cannot alter the outside. This building has had a lot of work done by owner and it shows very well. If you are thinking about downsizing or a semi retirement, you should look at this place. 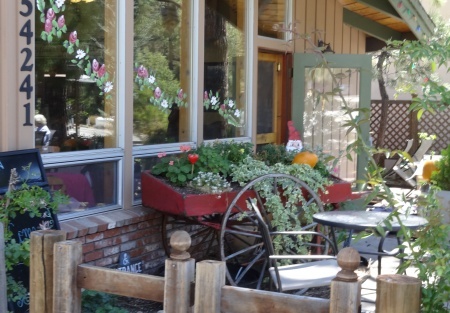 High in the San Jacinto mountains, you will be among the tall pines and the beauty this community offers. Owner has lived in the area over 40 years and hates to sell, but it's time to make a new dream come true? Will it be yours?